Older Pregnancy: Is it Possible to Have a Child in Later Years? Are you one of the many women wondering, “what are my chances of getting pregnant” as you age? As today’s society provides women with more options to explore than ever before, the need to get married and settle down right after college has been replaced by a drive to see the world or climb the professional ladder. But what does this mean for women who still want to build a family later in life? However, the question of possibility is not the primary issue for women trying to get pregnant in their late 40s and early 50s. This article will explain the options and risks surrounding a woman’s ability to successfully have a child in her later years. Despite a change in times, some people still find the idea of waiting until your late 40s or 50s to get pregnant slightly unorthodox. That being said, an average of 13 babies are born to mothers over 50 every week. Why are some women are choosing to wait? There are a multitude of reasons a woman might be having a baby later in life. Some are recently remarried, and would like the chance to have a child with their new husbands; others spend their lives focusing on their careers. Sadly, some women face medical issues forcing them to put off getting pregnant. For others, they’re still exploring a variety of fertility options, and aren’t ready to consider adoption or surrogacy yet. The fact is women may be a collective group, but each of us has our own story to tell and a background that has led us down certain paths. At the end of the day, though, statistics are black and white. How do age and menopause affect a woman’s ability to conceive? All women eventually “go through menopause,” but what does that mean? Do you wake up one day post-menopausal? By definition, premenopause is considered any time in a woman’s life before menopause begins. Many experts loosely use this term to describe the period when she’s most fertile. Perimenopause, on the other hand, usually occurs during a woman’s late 40s and describes the beginning of the menopause transition. She begins to experience a drop in estrogen and hormone levels, along with a variety of symptoms such as hot flashes and mood changes. This stage also involves a reduction in menstrual cycles. So, when are you classified as a postmenopausal woman? By scientific definition, a woman enters postmenopause once she’s gone more than a year without a period. The entire process can take several years to complete. What are the chances of naturally getting pregnant after menopause? Unfortunately, a woman in the perimenopause stage who hasn’t stopped having periods has less than a 20% chance of getting pregnant. While the likelihood of conceiving after she’s stopped menstruating is slim, it’s not impossible. Menopause or not, the chances of getting pregnant later in life - especially after menopause - are small. If you do find yourself trying to become pregnant after your 50th birthday, you’ll need the assistance of estrogen and various hormones to reverse menopause if it has occurred. There’s no way to sugarcoat complications that can come with pregnancy in a woman’s later years. There may be one option worth looking into. Not Too Old: Are You a Candidate for Egg Donation? Donor egg IVF is an incredible option for older women who still desire to become pregnant. While pursuing a fresh donor egg cycle is no longer an option for postmenopausal women, as they have no menstrual cycle to sync with their donor, frozen egg donation could be the answer you’re looking for. U.S. facilities have strict requirements for older women - specifically women over 50 - interested in undergoing a frozen donor egg IVF cycle. Since the average age of menopause is 51, only a few programs will treat women beyond the age that nature itself intended. Women over 50 who are curious about their chances of becoming a donor egg recipient should seek out their fertility clinic for specific health and age requirements. While many women think a fresh donor egg is the best choice to have a successful IVF cycle, most women don’t realize how close the success rates of fresh and frozen donor eggs are nowadays. Advances in flash-freezing techniques diligently work to protect donated eggs from ice crystal formation and decomposition during storage. These developments offer results mirroring those of a fresh cycle. Unfortunately, just because the odds of getting pregnant are about the same for frozen and fresh donor eggs, it does not mean the chances of a 54-year-old getting pregnant are the same as a woman in her 30s or early 40s. If using donor eggs, a woman over the age of 50 has the same likelihood of getting pregnant as a woman in her 20’s or 30’s. Nonetheless, having peak health over the age of 50 can mitigate complications in what is deemed a high-risk pregnancy. One major advantage that comes with getting pregnant later in life is experience. Compared to younger women, women who become pregnant later have a broader range of life skills and familiarities. These women have established financial independence, found greater wisdom, and developed a better sense of self. But, before an older woman becomes pregnant, it is important for her to know and accept the risks, especially if she is over 50. While older pregnancy is becoming more widely accepted due to improved medical practices and societal growth, there are still some people who believe women in their late 40s or in their early 50s are too old to be getting pregnant. 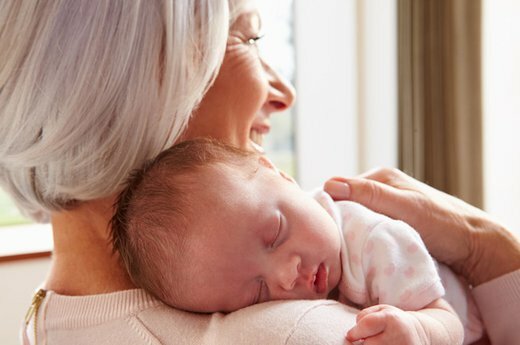 While many U.S. women are now living well into their 80s, women who choose to have children when they are older will ultimately have less time with them than if they had become pregnant when they were younger. This unfortunate reality may cause people around you to feel resentment or anger because you will have less time with your child. You might find yourself in uncomfortable situations or facing uncomfortable questions. If you are one of these older women, you should take into consideration the realities of becoming pregnant later in life. •	U.S. women giving birth over 50 is on the rise; in 2012, 600 women over 50 gave birth to a baby. In comparison, only 144 births like this occurred in 1997. •	In 2013, 0.02% of the babies born belonged to mothers over 50. •	Of that number, a third of the babies were the first child for these women. While modern-day technology makes older pregnancies a possibility, it’s vital to understand they do not come without risk and effort. Current headlines show success stories of people like Janet Jackson having a child in their 50s. If you’re interested in having a baby later in life, you should know many of the women you read about more than likely got pregnant through donor egg IVF. Though celebrities like Jackson may not be outspoken about their donor egg usage, it is nearly impossible for her to have conceived naturally and carry her child without complications at her age. Our society is one built on opportunity and freedom. There is no rule stating you should not, or cannot, get pregnant in your late 40s or early 50s. That being said, accepting the reality of the situation is essential. If you are an older woman in good health and great physical shape, there’s no reason you shouldn’t consider frozen donor eggs to get pregnant. Whether you’ve finally reached the right time in your life, have overcome a medical battle, or simply want to grow your family - every child is a miracle. You deserve the chance to try and find yours.